Emerald earrings are a timeless classic. Read on to find out why! At a value of ten, diamonds may be the hardest gem according to the Mohs scale, but emeralds come in at a respectable eight in the ratings. These jewels are extremely durable, which makes them a good investment if you know how to pick a good stone. Let's take a look at the characteristics of the most desirable emeralds. Not all emeralds are equal, and color has a lot to do with the value of an individual stone. These gems come in many shades of green, from nearly yellow to a rich forest green. Generally speaking, the darker the color, the more valuable the stone.However, color isn't the only consideration when it comes to adding value. Impurities are quite common in emeralds, and some gems are fairly cloudy, while others display incredible clarity. Therefore, when choosing emerald earrings you should let color and clarity be your initial guides in determining the true worth of any set that catches your eye. After color and clarity, cut is the next most important feature of a quality emerald. Oval-cut, octagonal-cut, and of course, classic emerald-cut emerald earrings show off stones of great purity to their best advantage.Carat weight also adds value to a piece; however, your personal taste may run to gems at the smaller end of the spectrum, so choose a size that best suits you. Here are a few tidbits you may or may not know about emeralds. The emerald is the traditional birth stone for the month of May. 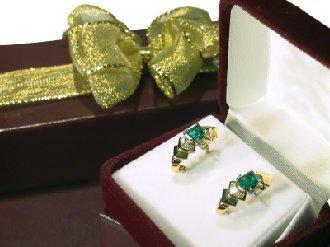 Emerald earrings are a wonderfully appropriate gift for a woman celebrating her fifty-fifth wedding anniversary. The most highly valued emerald is the Emerald of India. Here are a few suggestions to help you shop for your next pair of emerald earrings. You may find exactly what you're looking for, or perhaps just find enough inspiration to narrow down your search. Jewels for Me is an online jewelry store that bills itself as having the largest selection of emerald earrings on the Internet. Whether that's the case or not, this store certainly does have a wonderful collection. Blue Nile comes with some impressive recommendations. The site bills itself a Forbes' favorite online jeweler for six years running.A quick search of the emerald department revealed just five sets of earrings, but there were plenty of beautiful companion pieces, including rings, bracelets and pendants. Jewelry Central offers a modest selection of emerald earrings. Our favorite? These pierced-style 14k Gold Emerald and Diamond Earrings. Shopping for emerald earrings is a breeze once you know how to pick out decent stones. Take your time and visit several jewelers so you have a better idea of what's available before you commit to a purchase.